The contest in the higher naval educational institutions included in the system of the Military Training and Research Center (VUC) of the Russian Navy came out with indicators that were fixed during the Soviet era. This was reported by TASS chief VUNTS Navy Vice Admiral Vladimir Kasatonov. “Since this year we have reached the full set. We have had incomplete sets for a while, now we have completely reached the opportunities and the contest that was before the 90s: more than four people per seat, girls – more than 12 people per seat. I think that this is not the limit, “Kasatonov said. Also, the vice-admiral noted a high minimum score among enrolled in naval schools. “With such minimum scores go to prestigious educational institutions. While our specialties are very complex: from nuclear physics, management of nuclear reactors to the management of complex weapons and calculation of the ship’s course at sea, “he said. 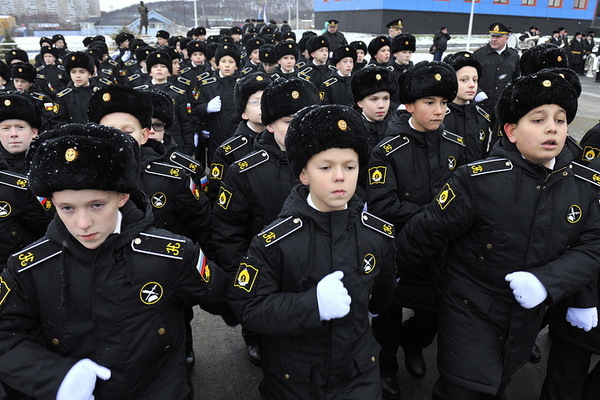 According to Kasatonov, in the next academic year the higher naval institutions of the VUCC of the Navy plan to recruit 5-10% of cadets more than in the current one. “About 1,000 people will be selected for all naval institutions that are part of the system of the Military Science and Training Center of the Navy. This is 5-10% more than this year, “- said Kasatonov. In addition, two higher schools that are not structurally part of the VUCC of the Navy, the Pacific and Sevastopol, will receive about 150 recruits each. The Military Training and Research Center of the Navy dates back to its history from the time of Peter the Great, when the Navigational School was established in Moscow in 1701. At present, the VUCC includes the highest naval institutes and academies in St. Petersburg, Pushkin, Petrodvorets, Kaliningrad. Since January 2012, the VUNTS Navy has training centers for training submariners in Obninsk, Kaluga region and Sosnovy Bor Leningrad region. VUNTS Navy of Russia, will receive until 2020 90 new training and training complexes and simulators, said Vladimir Kasatonov. “We are continuously receiving new simulators: until 2020 – another 90, and this year – 16 new simulators and samples of new equipment,” Kasatonov said, adding that now the center is equipped with modern simulators by 80%. He explained that simulators can teach cadets to work on the newest surface and underwater technology, modern communication systems and radio equipment, as well as the use of modern diving equipment. At the same time, cadets can work out the actions in conditions of a complex weather situation and simulated contingencies. About 2,5 thousand officers of the Russian Navy will be sent in 2018 for retraining in higher educational institutions in the VUC system of the country’s Navy, Kasatonov said. “Retraining will be about 2,5 thousand people. This includes those who are on short-term retraining, on longer terms (up to nine months) and those who receive higher and second higher education, “- said the vice-admiral. According to Kasatonov, the constant retraining of officers is necessary in the conditions of rapid technical renewal of the fleet. “The fleet does not stand still; new ships appear on an ongoing basis. And for this, new knowledge and new skills are needed, “he said. Also, the vice-admiral said, the program of training of teachers of naval schools on the operating ships of the fleet will be continued. “Each year they spend a certain number of hours, training on the operating fleet, studying operating ships, depending on their specialty, real equipment and peculiarities of its operation in the fleet,” he explained.